Okay, so here’s how I do it. I’m not claiming this method to be The Best Way to make a pie crust, but it works for me. So far nobody’s ever gagged or sent a slice back to the kitchen. As you’ll see, it’s really fairly simple, especially if you use a food processor. And as long as you have the food processor out you might as well make a bunch. Double, triple, quadruple the recipe; the Queen is confident you can do the math. 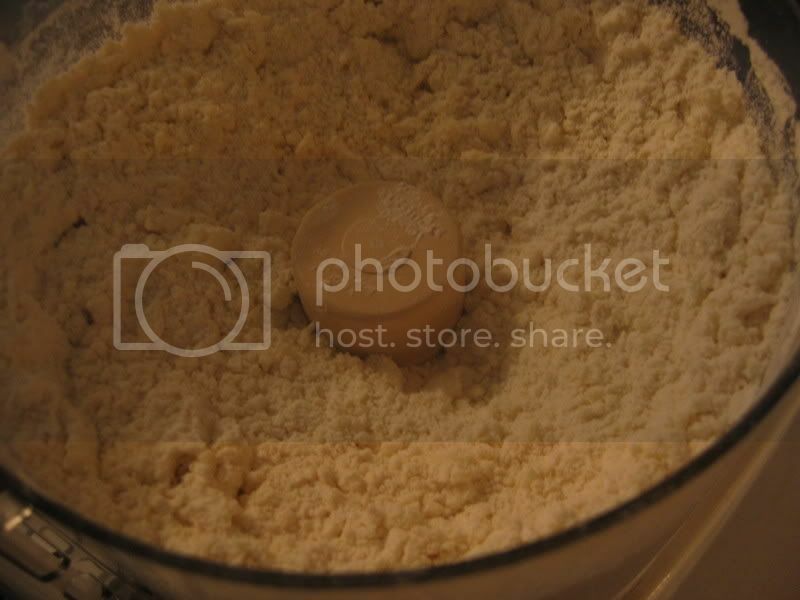 How gratified you will feel to reach into your freezer and pull out a disk of dough – ready for the next day’s baking! I tried not to gasp. How could she tell? Was it my John Deere suspenders? The straw poking out of my pocket? Perhaps my eau de manure cologne? Thankfully, none of the above. Ms. Ephron was under the impression that in order to make multiple pie crusts, one must be in possession of an enormous amount of freezer space, something residents of Manhattan are presumably likely to shun in favor of other things -- all 20 volumes of the Oxford English Dictionary, say, or their collection of Matisse lithographs. I didn’t get around to explaining that these petite disks take up less space than a bread plate, far less, in fact, than the cardboard box that holds the Pillsbury Unroll and Bake or a plastic carry-out container from Gourmet Garage. And anyway, I’m not going to argue with Nora Ephron. I mean, take a look at Heartburn and see what happened to Carl Bernstein when she got pissed off at him. . . Gather all your ingredients together. Make sure your butter is well-chilled; slice each stick into 10-12 pieces. Throw the flour, sugar, and salt into your food processor and give it a whirl. Throw the flour, sugar, and salt into a bowl and stir it up. 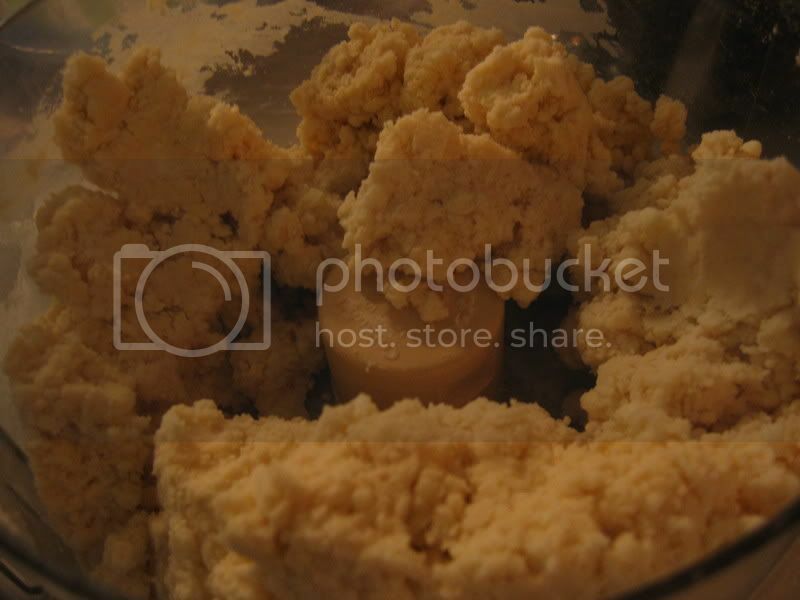 Add the butter, using the Pulse button until the butter and dry ingredients look like coarse sand or pebbles or tiny bubbles. 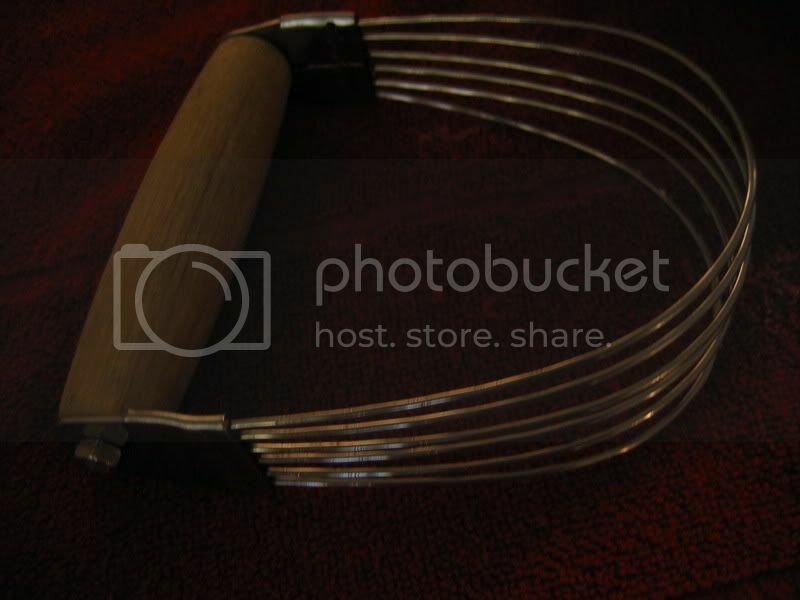 OR …Using one of these nifty gadgets called the Pastry Blender (or two knives, in pinch), smash the butter into the dry ingredients, trying to achieve the same gravel-y results. Add 1/3 c. ice water to processor, and pulse again, until mixture seems to be coming together. If this is not happening, add another ¼ c. or so. 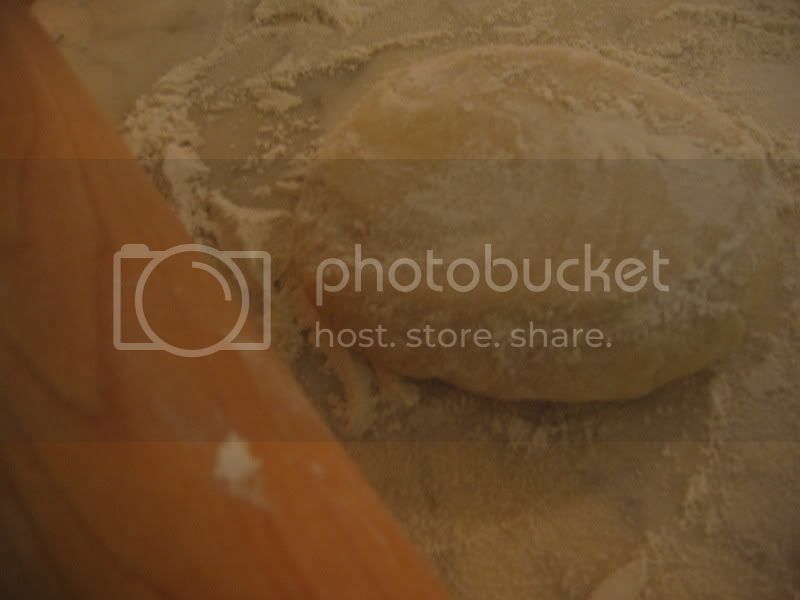 Stop pulsing and check to see if you can form dough into a ball. If so, stop. If still too dry, add a bit more of ice water and pulse to combine. 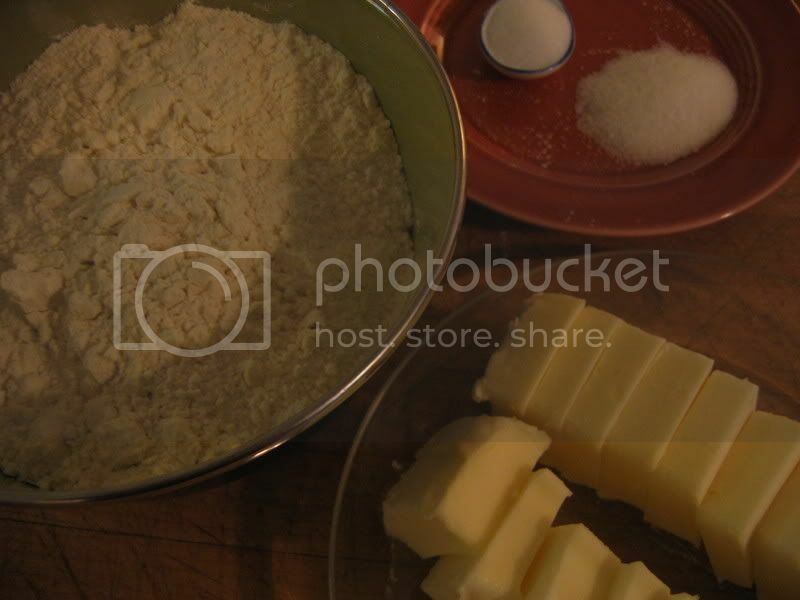 OR…Sprinkle ice water over butter/flour mixture and using a fork, mix until dough can be patted into a ball, adding slight amounts of ice water if necessary. 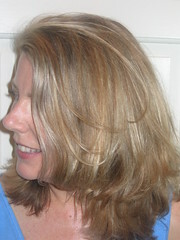 Pat each into a disk, flatten slightly, wrap in plastic wrap. If you plan to use dough immediately, put in refrigerator and let chill for at least a half an hour. If you plan to reserve for later, toss into freezer. Pull out your rolling pin and wave it menancingly in the direction of anyone who looks skeptical at your pie-making prowess. Make sure you have a pie plate at the ready. 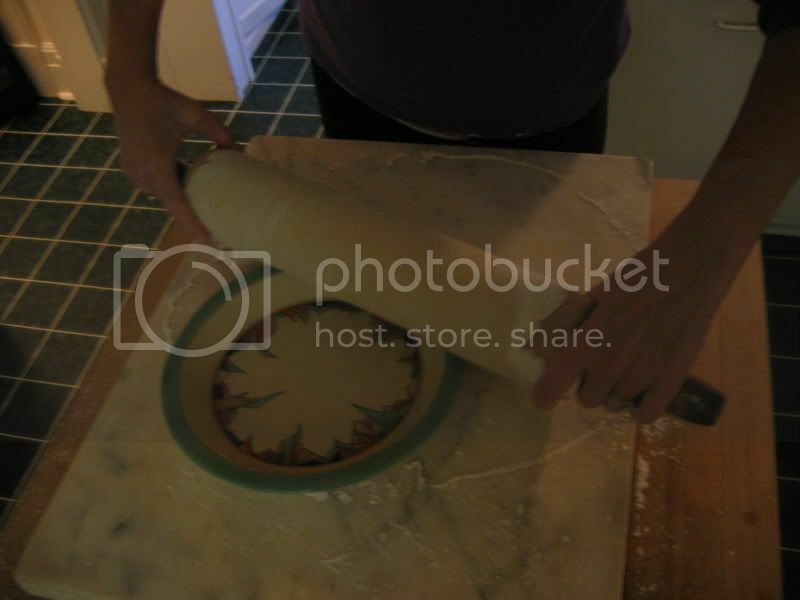 Remove plastic wrap from dough and position disk in middle of well-floured work surface. Rub flour onto rolling pin, too. Take a deep breath. 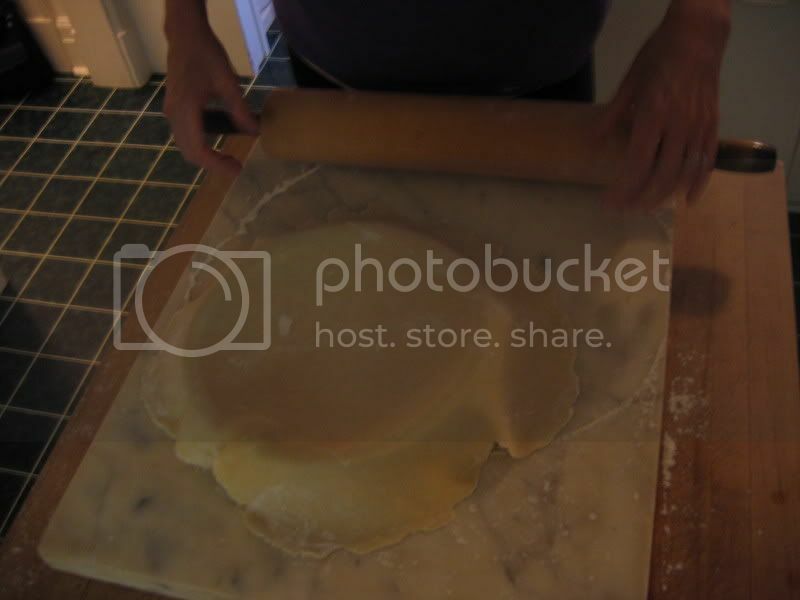 Place rolling pan on dough and roll outwards, away from you. Gently lift dough and give it a quarter turn before placing back on board and repeating the away-from-you rolling motion. Do another quarter turn and repeat. The goal is to avoid the back-and-forth rolling motion that is said to toughen the dough. Keep checking to make sure you have enough flour on the board and your rolling pin; you don’t want the dough sticking to either. 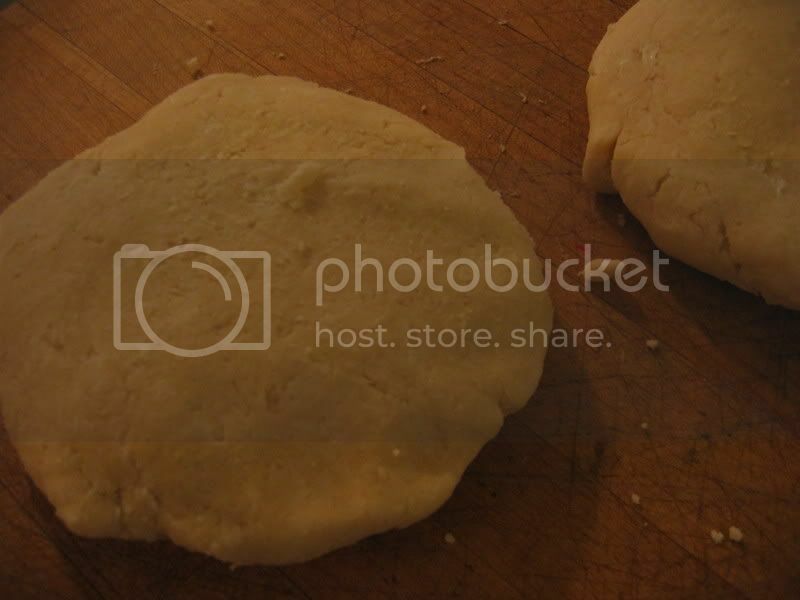 When you seem to have achieved some semblance of a circle – approximately 3 inches bigger in diameter than your pie plate, place rolling pin on top of dough. 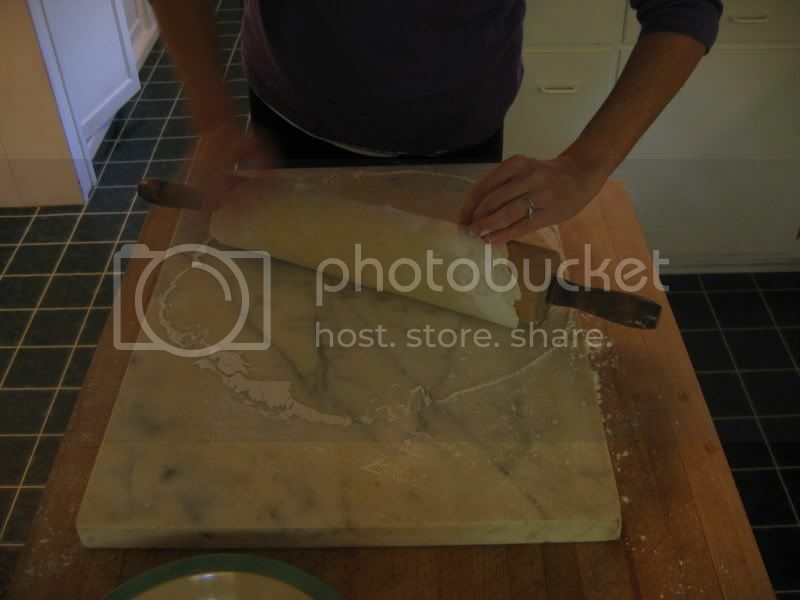 Lift one edge of the dough onto the pin and roll it up slightly. 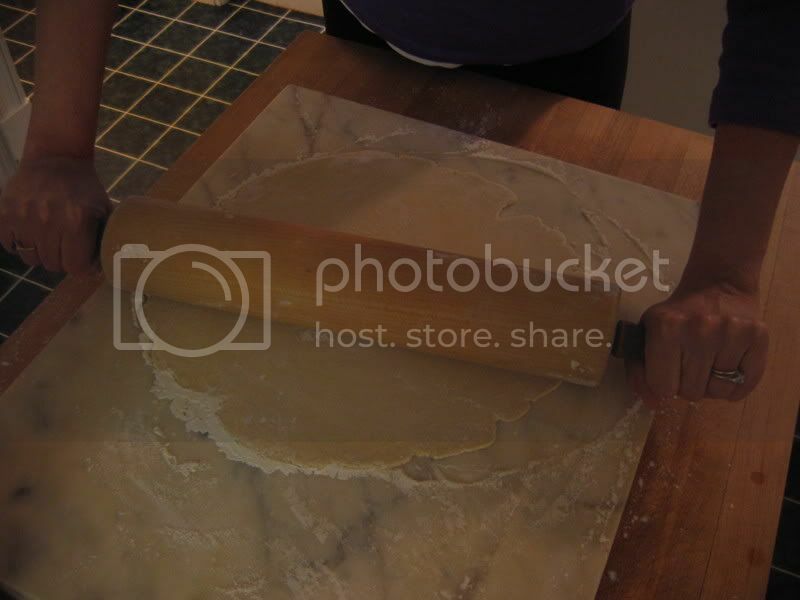 Position pie plate beneath rolling pin and then, allow dough to unroll over pie plate, shifting it gently to let pastry fall in place. Cool, huh? Ease dough into plate, pressing slightly. What you do next depends on the type of pie you plan to make. Some recipes require that you pre-bake a pie shell before filling; others do not. Some pies require a top crust; we’ll work on that next week. 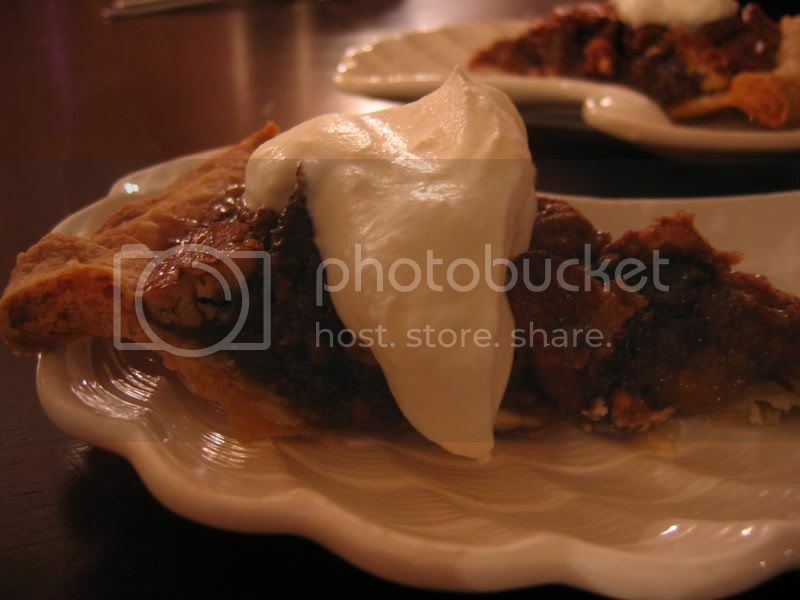 This pecan pie is very simple and requires neither a top crust nor a pre-baked pie shell. Trim edge of pastry with scissors until it hangs about an inch or so over the edge of the plate. Lay scraps aside and wait for teenager to come and scarf them up. Fold edge slightly under itself and then, using finger and thumb, crimp edge of crust, making indentations along pie shell. 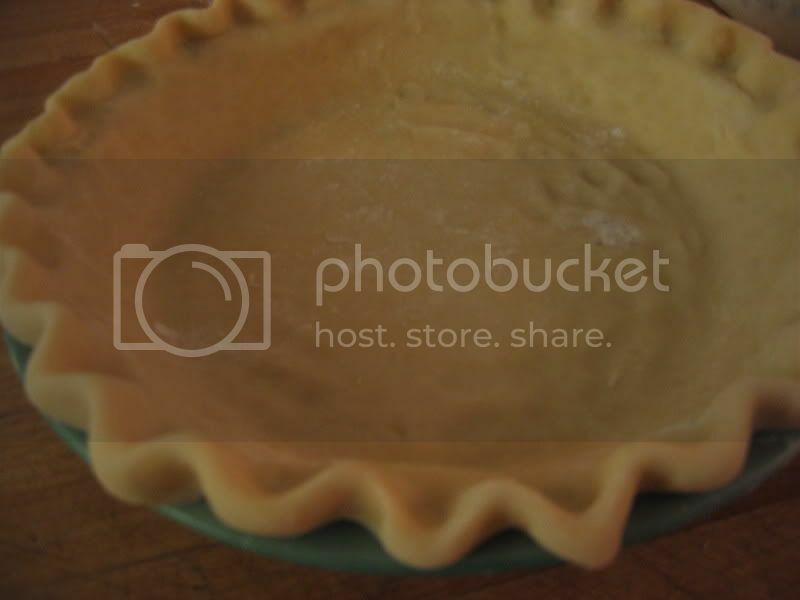 Put pie shell into refrigerator while you prepare filling. Consider this pie a Fall Classic: pecans suspended in a sugary sludge and flavored oh-so-faintly with a bracing shot of bourbon. Preheat oven to 350. Lightly beat eggs; add brown sugar, corn syrup, butter, vanilla, and bourbon. 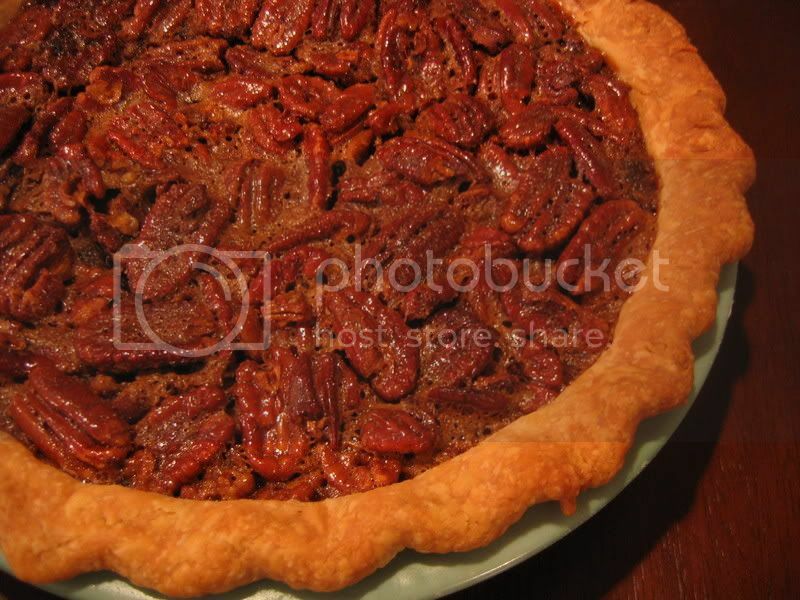 Fold in pecans and pour into pie shell. Bake approximately 50 minutes, or until knife inserted into pie comes out clean. Let cool. Now it’s your turn, dear Reader! Thank you, thank you, thank you for the play-by-play instructions. As one of your true and loyal admirers who has not only tried whole wheat flour, but subjected it upon your majesty's table, I thank you for the warning, once more! When making pastry check your fiber-seeking constitution at the door. Has the Queen really broken crust with Nora Ephron??? Did she happen to mention whether well made pastry can do anything for my sagging neck? I may feel badly for my neck but seem to forget all about it when indulging in a good pie. So, I was having lunch with Nora's third cousin Epi the other day. He lives out here on the left coast now, where he finds things much more hospitable and laid back compared to the land of tiny freezers. Anyway, I asked him if he knew how big a batch of pie crust one can make in a 10-cup food processor (ummmm... can I mention brand names here? It's the French-sounding one that rhymes with "cheesy fart", model DLC-10)? Anyway, Epi didn't know and suggested that I direct the question back at you. I have a food processor, but I'm assuming that the chopping blade, the grater, and the slicer aren't what we're looking for here. Is there a mixing attachment, perhaps one that came with the food processor but was subsequently misplaced somewhere in Sir Markb's shire? Bakerymaiden, Nora's neck looked pretty good. Your neck looks pretty good. Must be the pastry. anonymous, How did Epi's neck look? 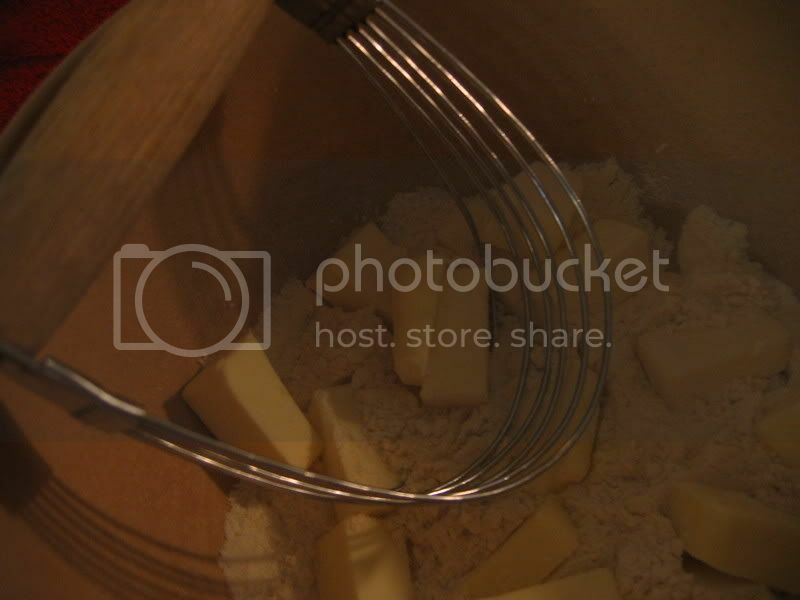 I'd probably make no more than a double batch of pie crust per food processor bowl. Otherwise, the flour may fly. sirmarkb, The standard s-blade, aka chopping blade, is the only attachment you'll need. Mind your fingers, though. Epi's neck looked fine. I expected something like the geoduck-like appearance of people who have spent too much time... well... let's not go there. I'll just say, it wasn't saggy. anonymous.... did you see the "Dirty Jobs" episode about Geoduck farming in Washington State? Let us pray that none of our necks resemble one. I think they showed a geoduck pie recipe at the end of the show... most definitely unsuitable for our Queen.